Where: Koerner Hall, St. Lawrence Centre for the Arts, Mississauga Living Arts Centre and more! Details: The Festival of Arabic Music & Arts (FAMA) will present a series of concerts and other live performances across the GTA including Toronto, Mississauga and Brampton, both free and ticketed events with almost 100 artists, local and from around the world. The Festival will open on October 28 with a double bill at the esteemed Koerner Hall with Toronto’s own three-time Juno-nominated Sultans of String, an instrumental group that combines elements of Spanish flamenco, Arabic folk, Cuban rhythms, and French Manouche Gypsy-jazz, opening for special guest Iraqi guitarist, singer and composer Ilham Al Madfai. From picking up his first guitar to forming The Twisters, the Middle East’s first rock band in 1960s Baghdad, this maverick Arabic musician has traveled the world with his band bringing Arabic music to a whole new generation. Closing night brings another Iraqi artist to the GTA, master oud player Naseer Shamma, who will play with members of the Canadian Arabic Orchestra in the expansive Hammerson Hall in the Mississauga Living Arts Centre. After receiving his diploma from the Baghdad Academy of Music, Shamma began to teach oud while composing and performing music for theatre, film and television. He created the Arabic Oud House in Cairo, the first school completely dedicated to teaching oud where scholars of all ages come to study. For this appearance in the Festival, Shamma will perform a traditional classical Arabic repertoire. On November 9, The Aga Khan Museum will host the world premiere of Origins, an Indigenous and Arabic presentation that includes classical, folk and contemporary music, throat singing, and ceremonial performances, and a joint performance of traditional Native songs accompanied by classical Arabic instruments. In the spirit of truth and reconciliation, in the interest of embracing the rich diverse heritage of Canada, and in an effort to deepen the sense of belonging among Canadians of Arab heritage, Origins is produced and presented in association with the Native Canadian Centre of Toronto, the Arab Community Centre of Toronto, the Aga Khan Museum, the artist Laura Grizzlypaws, and Rumi Canada. 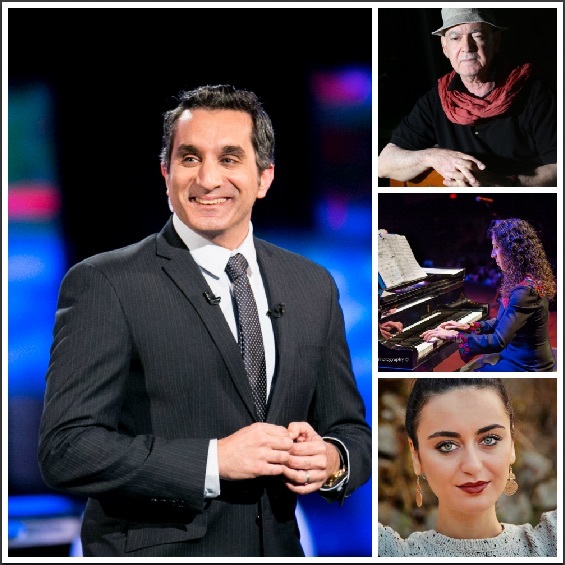 Other Festival highlights include Egyptian comedian writer, producer and cardiothoracic surgeon, Bassem Youssef (Nov 11 @ Bluma Appel Theatre, Toronto) host of the satirical television news program Al-Bernameg (The Show) from 2011-2014. Often compared to Jon Stewart, who is a fan himself, a documentary film, Tickling Giants, about Youssef’s rise and fall in Egypt was released in 2016. Dedicated to connecting audiences with classical Arabic music while celebrating the freedom and diversity of Canada’s cultural landscape, the Festival of Arabic Music & Arts hopes to deliver world harmony one note at a time!